Today? Doesn't really feel like a Friday. We were gone all last week; got in late Sunday night. Maggie went to school Monday and Tuesday like regular. Wednesday she had school, but then evening baton class/lesson was cancelled, followed by a snow day Thursday and today. Whoa. Someone else just joined my Perfectly Posh team! There's a special - $5 off the kit for the rest of February - so I knew a few people were adding team members, but one just joined that I hadn't heard in advance! Woo-hoo!! We're the fastest growing team in Posh! I'm glad the ton of snow we got this week (okay, officially 12.4 inches) didn't bring bitter cold with it. My kids are having a blast playing outside. Yet another week has almost passed when I spent my time trying to fall asleep at night, or in the shower, planning on how I was going to clean my office. But the office looks nearly the same as it did on Monday morning. Huh. Snowed in has also meant I got a lot of desk-work done. Usually while eating a lot of crap-food. Did you know there are currently bags of Starburst Jelly Beans with just RED available, and also Swedish Fish Jelly Beans?? YUM! If it keeps not-snowing this afternoon, we just might venture out to get a birthday present for tomorrow, and if we make it that far, pick up pizza for dinner. Rumor has it we're expecting another winter storm next week, but so far Wunderground.com doesn't show it being as big as I've heard. I just hope it's gone by next weekend so we can go to baton competition on the other side of the state without an adventurous ride. Only 76 days til my awesome spring girls' weekend with my bestie!! Anyone own a pair of Tiek's? They look like adorable ballet flats, and are rumored to be comfortable, but they're not cheap. I'd like more actual opinions from people who have worn them before I invest. As a woman who doesn't wear heels, I'd love a cute, comfortable option besides tennis shoes. Sounds like a good week for you considering. My kids are having a blast outside even right now! 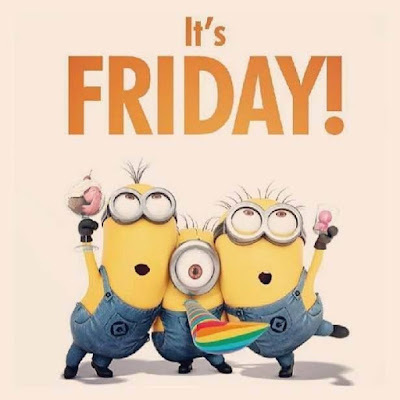 With yesterday off of school, my kids weren't sure that today was Friday! I want a pair of Tieks as well. I want them to look cute in a dress while walking around Disney, lol. They would have to be so comfy! We only received 2 inches. Oh man...Don't tell me about jelly beans -- those are a springtime weakness of mine! Sounds like a fun week! I totally missed the "Swedish" in "Swedish Fish." I thought I read "Fish Jelly Beans."